EverBlock Flooring is easy to install and remove and is designed to be transported efficiently and compactly in pre-assembled sheets, on pallets. Sections are typically stored on standard 40” x 48” pallets and transported on-site using a forklift or a truck with a lift gate. Our EverBlock Transport Cart may be used to efficiently transport flooring within a facility or around an event site. 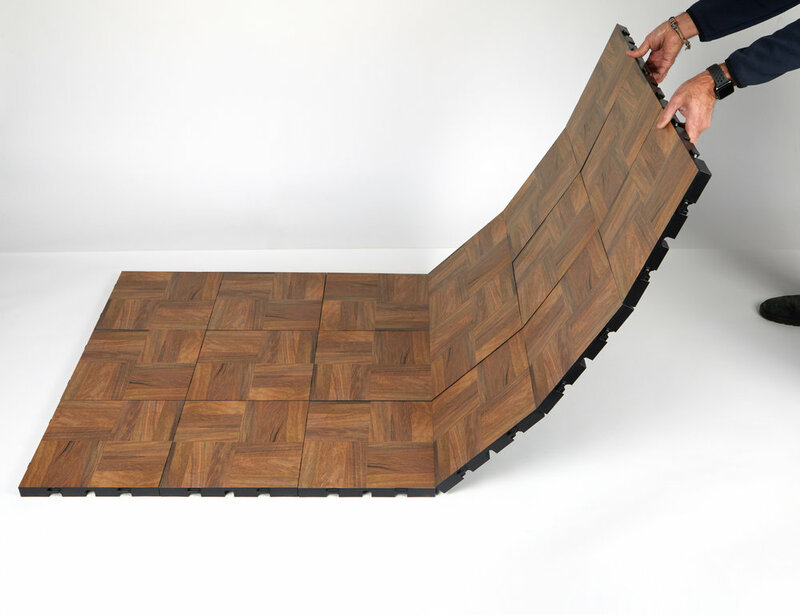 EverBlock Flooring transports in pre-assembled 3ft x 3ft or 3ft x 4ft sections. This speeds deployment of the flooring and allows you to transport “sheets” for easier installation, rather than individual 12” x 12” or 18” x 24” modules. To begin, simply remove the first flooring sheet from the pallet and place in one corner of the floor to be installed. Be sure the connector loops, which can be found on two sides of each sheet, are always facing toward the inside of the floor to be built (towards where the flooring will eventually be installed). This is so that the adjacent connectors can easily slide into position over the loops and then snapped down and engaged. STEP 2: Position the next sheet adjacent to the first, with the male clips facing the female loops, ready to be snapped in place. Place the next flooring section adjacent to the prior one, with the connectors positioned in the same direction as the prior sheet (loops facing toward the direction of install), such that the male and female connectors are ready to be engaged between sheets. We suggest working in lines, or rows, completing each subsequent row before starting the next line. This will prevent drifting or misalignment of your floor, which can occur on larger installations. If you have an oversized installation (stadium flooring for example) you can work simultaneously in rows and keep installing such that the prior row is further along in progress by about 5 sheets (20ft or so) than the next row. Several teams can work in lines, one just behind the prior. STEP 3: Use your foot to nudge flooring over to the first panel, such that the male clips ride onto the female loops. Sections are designed to self-align when nudged together. It is helpful to use the open “L” space in the corner formed by 3 sections (prior row and next row) to help guide placement of the next sheet. You can use your feet to nudge or kick sections into the open space of the “L” so that it is ready for connection on two sides. The male nub will ride up over the loops with a slight push or nudge with your feet. STEP 4: Use a backwards kick with your heel to engage the male clip into the female loop. Kick backwards towards the loop and over the clip. To connect flooring sections, press down firmly on the area near the male snap connector when positioned over the loop, depressing it into the opening of the loop. Press down until you feel a slight click, indicating that the connector is engaged. While the connectors are designed to self-guide into the receiver loop, due to ground variation, you may need to jiggle the connector area, using your foot, pressing down, until it engages. It is best to use a sudden, quick motion when connecting sections. Use a backwards kick at a roughly 45 degree angle to engage the clip into the loop. 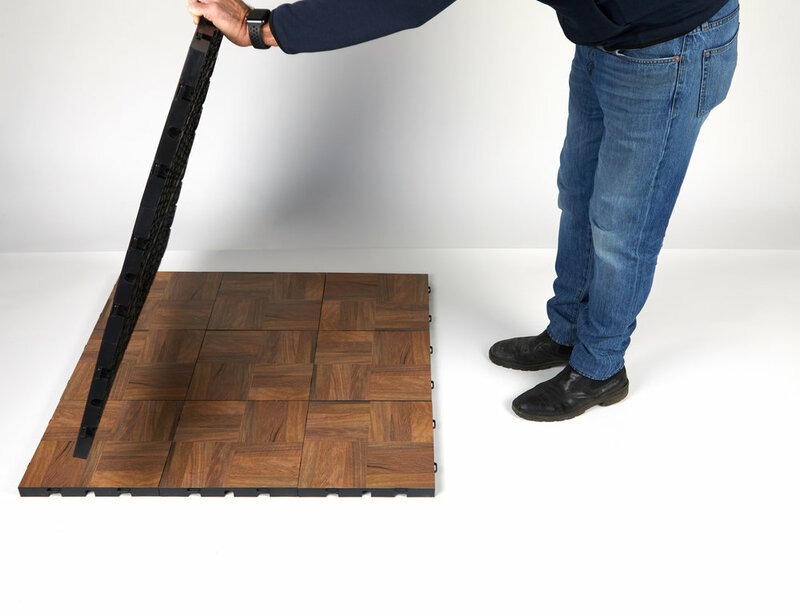 EverBlock Flooring is designed to dismantle quickly, by simply tipping the desired floor section back about 45% until it disconnects from the adjacent section. Preferred section sizes for transport and storage are 3ft x 4ft and 3ft x 3ft. When tipping up sections of floor for disconnection, be sure to place weight on the side of the floor that contains the connector loop, while pulling up at an angle on the side that contains the spring connector tab, thus disengaging in. By lifting the flooring section, such that the section begins to tip at the seam that is being detached, the connector locks begin to disengage, fully detaching when the floor is tipped to about 45 degrees. The second method of disconnecting flooring sections is utilized primarily when getting a side seam started. This method involves bending flooring sections backwards, such that they dis-engage and disconnect when they reach about 30%. This is the opposite of Method 1, which involves tipping flooring sections upwards and off the floor. In order to bend sections backwards, it is important to slightly lift sections off the floor and bend backwards at the seam line, slowly working your way along the line as the sections disengage. Lower the looped side downwards as you continue to disconnect the section. It is preferable to utilize Method 1 where possible as this is a speedier method. In general, we recommend working in complete rows, such that the entire row of sheets is disengaged first and then the row itself is broken down into sheets using the same tip and disconnect method. DO NOT pull straight up on tiles when they are flat as this has the potential to damage the connection system. Sections are designed to disconnect when tipped, which is always the preferred method of dismantling your floor. On a larger scale installation, you may find yourself disconnecting a row of sheets such that part is tipping while the rest of the row remains on the floor. Move slowly along the line, disconnecting sections as you go such that at the end the entire row is disengaged and ready to be broken down further into sheets. Stack sheets on EverBlock's Transport Cart or on pallets or in boxes for future uses. Note: We recommend cleaning floor sections prior to dismantling and storing, as it is easiest to clean a floor when its laid out. Utilize edging in areas where people are coming onto and off of your floor. For dance floors this is usually the full perimeter of the floor, while for game courts and basements it is usually only at entrances to a room. Installing and removing edging is similar to connecting tiles, except that the edging only connects on one side of the flooring. We offer male, female, and corner edge pieces that are designed to attached to the floor module using the same connection system as the module itself. To install edging, position a male or female edge piece, such that the opposite type of connector is aligned with the flooring connector on one side of the module at the area you need edging. Insert the male snap tabs into the female loop until it "clicks" and the edging is engaged. To remove edging, simply tip the edging at a 45% angle to detach. The corner pieces are designed to slot into the intersection of to edge pieces and utilize a "T" connector system. To install corners, simple raise the two edge pieces slightly, allowing you to slide the corner piece into position, with the T aligned with the channel on the side of each edge piece. Slide the edging into position such that the T is slid completely into the channel, engaging it with the edging pieces. One of the benefits of EverBlock are the integrated cable channels that run in both directions underneath each floor module. To run power cables underneath the floor, we recommend first installing your floor as desired until the area you want to run your cables. Tip the last row of tiles installed back slightly to expose the ground below and the cable channel on the underside of the tiles. Run cables along the floor, along the line of the cable channel, making sure to align any cables so that when you tip the floor back down, the cables will rest within the cable channel. You can use grip tape to hold the cable straight on the floor. This method is ideal for simple straight runs of power cables. Lay LED tape lights in channels on the underside of translucent sheets and secure with gaffing tape. The preferred alternative option, for running LED tape lights in the cable channels, is to lay the cable into the cable channel directly, while the floor is tipped upside down, and placing gaffing tape over the channel itself to hold the cables into place. When the desired cables have been successfully run, you can flip the entire flooring section over, connect the cables between sheets, and apply pressure on the locks to snap the floor back together. Continue floor installation normally and repeat anywhere you needed to run cables or LED lights. EverBlock Floors may be elevated on EverBlock building blocks and are designed to nest on top of EverBlock. We recommend you construction a solid block foundation underneath flooring, though with careful planning you can leave out a single lug width underneath the flooring, as long as it is supported on either side by blocks. This allows for the running of larger cables or complete lighting modules underneath the elevated floor. It is important to design your sub-structure of blocks so that there is always a block running along connection seams between floor sections, to provide support at the floors weakest point. For floors raised above a single block height, it is critical to alternate and stagger blocks so that the substructure is fully connected. We recommend using quarter blocks on 2 sides of your floor on the next layer installed, to allow the next layer of blocks to be staggered in a way that allows interconnection of the blocks with the blocks on the layer below, in both directions, thus providing greater strength to your sub base. Alternate between using quarter blocks and not using quarter blocks to stagger blocks for the greatest strength. Elevations over 30" require a guard rail in the USA (24" in Canada), so be sure not to raise your floor over 4 blocks high when being used for pedestrian use (display use platforms can be elevated as needed) unless you have made accommodations for a compliant hand rail system. We recommend cleaning your floor with standard cleaning fluids, such a Windex or equivalent. Use a soft damp rag to clean Dance Floor sections, which have a special laminated surface integrated into the module. For EverBlock solid colored (non laminated) floors, you can use standard cleaning fluids and even a pressure to remove any stubborn dirt. We have heard of some people cleaning floors in dishwashers, which is an option, but should only be done at lower temperatures. Installing floors in a stadium follows the same procedure as the above. Most important in a stadium sized installation is transporting pallets as close to their installation position as possible. This minimizes unnecessary movements by installers that slow installation. We suggest staggering pallets along the sidelines or on the perimeter running track. A typical install utilizes about 4 truckloads or 100 pallets of material. We suggest aligning 50 pallets on one side of the field and 50 on the other size of the field, evenly spaced, to facilitate easy access to material during install. A team of 15-18 people is required to install a full stadium field cover in approximately 6-8 hours (not including truck unload time). For full stadium installations, we typically provide a supervisor to guide you through your first flooring installation. Before installation of your floor, we recommend dry-cutting your ice and slightly reducing the temperature of your ice. Installing EverBlock in your arena for the first time requires the cutting of radiuses. We recommend first installing floor from just inside the goal line to just inside the adjacent goal line, leaving the area behind the goal line uncovered. Once this central section is installed, add sections as needed until you fill in the open uncovered areas as best as possible, staggering sheets as needed to accommodate the rinks radius. This allows you to see which sheet sections need to be cut. We recommend utilizing an upright band saw to cut the radiuses, thought a band saw can be used (with caution) to cut the necessary radiuses. Prepare a cutting table and designated area for cutting sections, with the understanding that you will be creating plastic shavings that need to be cleaned up (which is why we do not recommend cutting sections on the ice). Using a pencil, mark the section of each floor module that needs to be cut and cut using the saw, being careful to cut along the desired line. Install cut sections to complete your first floor installation. For breakdown, it is important to label radius areas and transport separately on pallets for further use. (i.e. NW, SW, NE, SW or similar coding). For the next installation, install the radius areas first, and then move across the ice until you reach the adjacent side, finally installing the remaining radiuses to complete your installation. When installing sections over ice, we recommend staging pallets by forklift ON previously installed sections, allowing you to minimize walking to pallets to pick up sections. Simply slide sheets over the ice and into position and step down on the clips to engage and connect the sections. Installation of a full ice rink (85x200 or 100x200) typically takes about 3-4 hours for a team of 4-5 people.